Be sure to check out Ripley Patton’s new Kickstarter Project to fund her YA novel Ghost Hand. 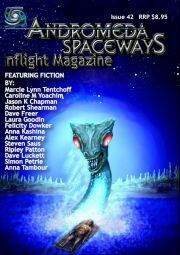 It launched today and anyone that backs her project in the first twenty-four hours will be entered in a draw to win a signed copy of Andromeda Spaceways Inflight Magazine #42, shown below, featuring Ripley’s YA fantasty novella, Over the Rim, a Sir Julius Vogel short-listed story. The magazine also includes illustrated cover art of Over the Rim, and eleven other wonderful pieces of speculative fiction. Ripley would really appreciate the membership of SpecFicNZ spreading the word about her Kickstarter project. And keep an eye on her website for updates and future draws for more amazing New Zealand-based fiction.